Which female competitor has done muscle-ups with a weighted vest? Why did Lauren Plumey change her Day 3 outfit? 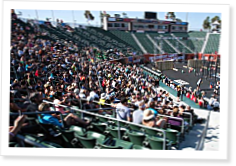 Who won the CrossFit Games unofficial post-event posedown? Should you fear giant Jerome Perryman? Can Mikko Salo train even harder in an attempt to win the 2011 Games? Whose hands were bloodiest at the end of the Games? Great article. I love getting the behind the scenes scoop. Brilliant!!!! It was incredible to be there and watch.